Hong Kong Reconditioned Arcade Machine Sale - SAVE $8000! This Hong Kong Arcade Machine Sale won't last long with this great range of machines. 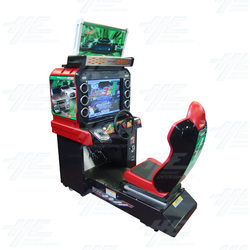 The machines include 4x Wangan Midnight Maximum Tune 3DX+ machines, 2x Blast City Cabinets, 2x Drum Mania V5 machines, 1x Drum Mania V4 machine, 1x Super Bashi Bishi 2005 machine, 1x Guitar Freak V8 machine, and 1x Shooting Chance machine! - Wangan Midnight Maximum Tune 3 DX+ is a racing/driving arcade game which is part of the ongoing car racing series which has proven to be quite popular in arcades across Asia, Europe and in the West. It is based off a popular manga series and all four machines can be linked for competitive play againts live opponents. Players choose characters to play through the story with and can use money and mods earned during the course of the game to modify their racing cars to make them fast, stronger or more durable. There are several modes and many stages to play through, so players will never get bored! The games use the BANAPASSPORT card system. - Drum Mania V5 and V4 are part of the Drum Mania series, a music and rhythm simulation arcade game which can be linked with their Guitar Freaks counterparts for competitive play. This fun and addictive game is now a long-running arcade series and has proven popular across many regions. - Super Bashi Bishi 2005 is another machine that is part of a long running series of arcade machines with immense popularity. These machines are so popular as they have a number of short, fun, and addictive games for players to enjoy. These games are controlled by 3 buttons, so the game play is quite simple and easy to understand for most players, however this often means it is relying on the player's reflexes and coordination skills to play. - Guitar Freaks V8 is part of a music and rhythm series which is a simulation game. It can be linked to it's Drum Mania counterpart for competitive play. This fun and engaging game has proven popular in a number of countries and is great fun for players of all ages. - Blast City is a popular 2 player video game cabinet from Sega. The classic cabinet features a Nanao multi-synch monitor which allows for 15/24/31khz video resolution. The monitor automatically switches to the correct frequency to match the game installed. The cabinet features Sega Model 3/JVS wiring. The Blast City cabinet is larger than most other Japanese candy cabinets, and the cabinet also features a large marquee. The cabinets speakers are at ear level next to the monitors bezel, rather than being embedded on the top. The cabinet also has an internal fan near the power supply. - Shooting Chance, also known as Penalty Shot, is a computerized indoor kicking arcade machine. With patent spring system on the ball holder and urethane covers, this machine promises fun and safety to all ages. This game is fun and simple, not to mention very safe, so it's suitable for players of all ages. Just kick the ball and see your score, it's that easy! This deal is perfect for customers looking to outfit a new location, update their current location, looking for new project machines, or for a plethora of other reaons. This many great machines, in working condition, for this price is a huge and unbeatable saving - so don't miss out on your chance to bag a bargain! Contact our friendly staff for more information.